A downed power line two weeks after the wind storm on Detroit’s east side. All photos by Steve Neavling. 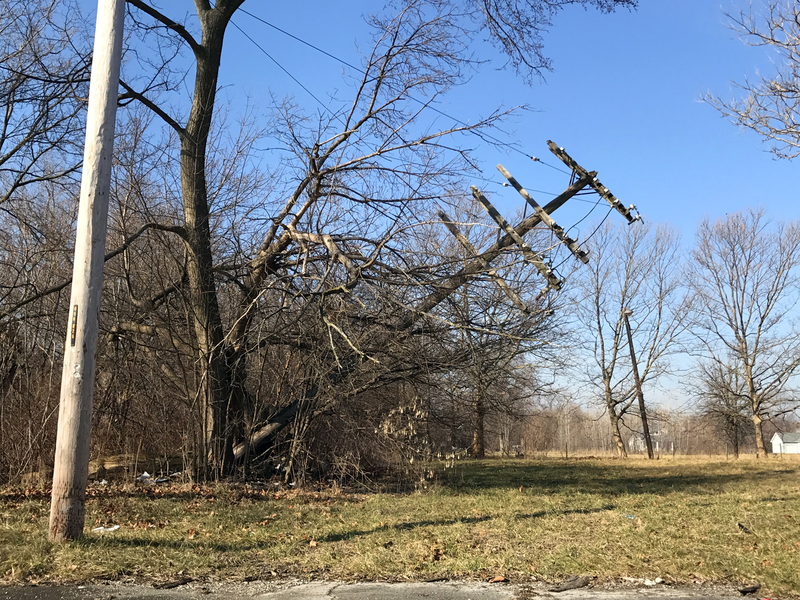 An abundance of dead trees and wind gusts that reached 60 mph earlier this month wreaked havoc in Detroit, causing massive power outages and the largest outbreak of fires since at least 2010. Records obtained by Motor City Muckraker show that firefighters responded to at least 170 reported fires and downed power lines from 10 a.m. to midnight on March 8. The wind-fueled blazes were so frequent that the city ran out of firefighters to respond to every call. One grass fire burned untended for several hours before consuming a large lot and three trees near Mack and Gratiot. It eventually burned itself out. This is a typical alley where trees crowd power lines. In many of Detroit’s neighborhoods, dead and dying trees are so pervasive that they outnumber live ones. Many of the rotting trees surround power lines and are easily toppled by the wind. On March 8, downed power lines fell on garages, houses and lawns, sparking fires that quickly spread because of strong wind gusts. Two weeks after the storm, many fallen trees were still leaning on power lines, and some were still blocking streets. The primary problem appears to be ash trees, which were decimated by the emerald ash borer in the early 2000s. Towering dead elm trees also are pervasive. 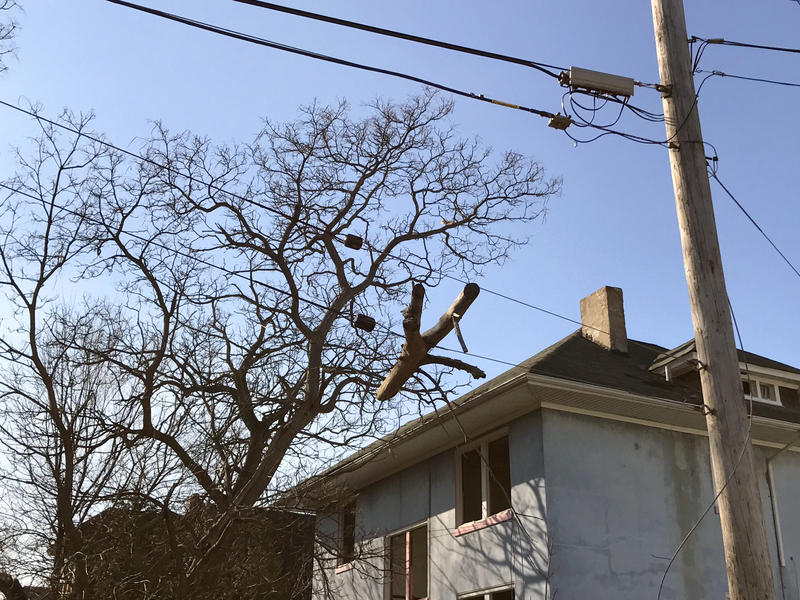 With decades of budget struggles, the city has not placed a priority on tree removal, leaving many to rot in front and backyards. In September 2010, 53-year-old Chester Carter was killed when wind knocked down a dead tree in his front yard and struck him. His fiancé, Jeannette Brown, told me she called the city for years to knock down the dead ash trees that dotted her block in Virginia Park. But no one came. A dead piece of wood rests on a power line on the east side. DTE Energy is responsible for trimming and removing trees within 15 feet of a power line. But with so many dead trees across the city’s 140 square miles, DTE doesn’t have enough crews to make sufficient progress. In the past two years, DTE said it spent $88 million removing trees near power lines in its service area. “As we become aware of dead or dying trees that pose a hazard, those trees are prioritized and taken care of that way,” DTE spokeswoman Ronesha Mullen told me. But residents like Roberta Ralston have grown frustrated with DTE because of the company’s slow response to hazardous trees. 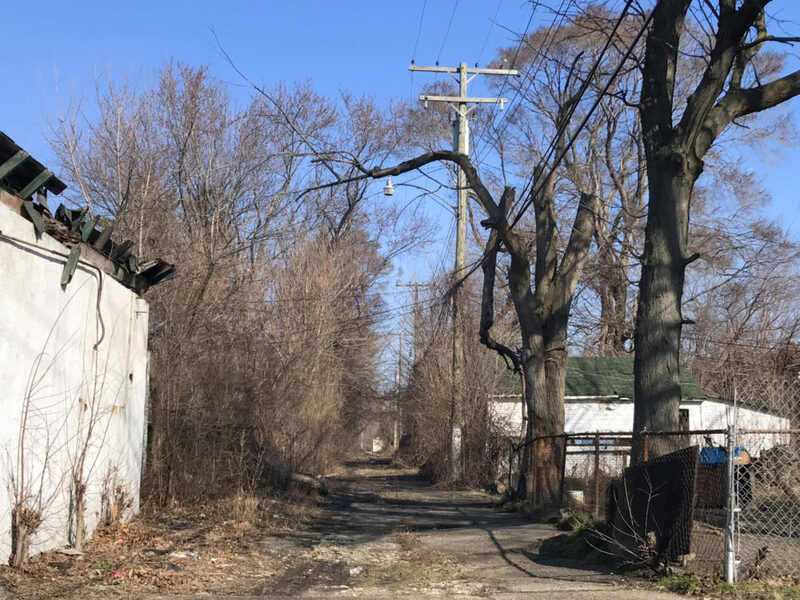 Ralston said she called DTE for years about trees and vines crowding power lines behind her house and Land Bank properties in southwest Detroit. About two-thirds of power outages are the result of fallen trees, according to the Michigan Public Service Commission. On March 8, more than 4,000 power lines collapsed in DTE’s service area, causing outages that lasted up to a week in the bitter cold. Mayor Mike Duggan’s administration recently removed 3,000 trees and plans to remove another 3,000 by the end of the year. The Detroit Land Bank, which owns tens of thousand of properties with dead trees, also plans to hire a contractor to remove trees. But the city’s focus will be on dead trees that are in medians and between sidewalks and streets. DTE discourages cities and residents from clearing trees near power lines. Dead tree on Lillibridge near E. Warren. 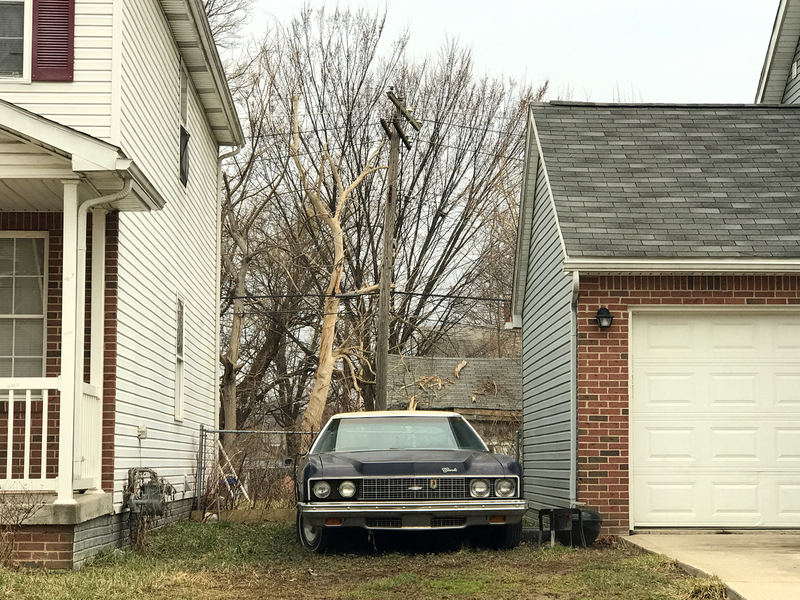 To gauge the severity of the problem, Motor City Muckraker surveyed a 3-mile area on the east side that was hit hard by wind-whipped fires and power outages on March 8. At least two dozen dead trees were still leaning against power lines on Tuesday. Dead trees were strewn across front lawns and behind houses. Thickets of dead trees crowded power lines.